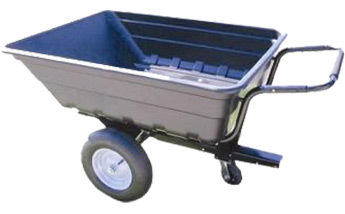 Combo Poly Tipping Trailer Wheelbarrow/Trolley with Jockey Wheel, our Most Popular Ride On Tow Behind Tipping Trailer...that doubles as a wheel barrow/trolley. It has a rust proof tray and heavy duty once piece axle so you can carry up to 300Kg. It's pneumatic tyres have ball bearing wheels and it's a tipping trailer as well, so attach it to your ride on mower for that extra hand around your property!